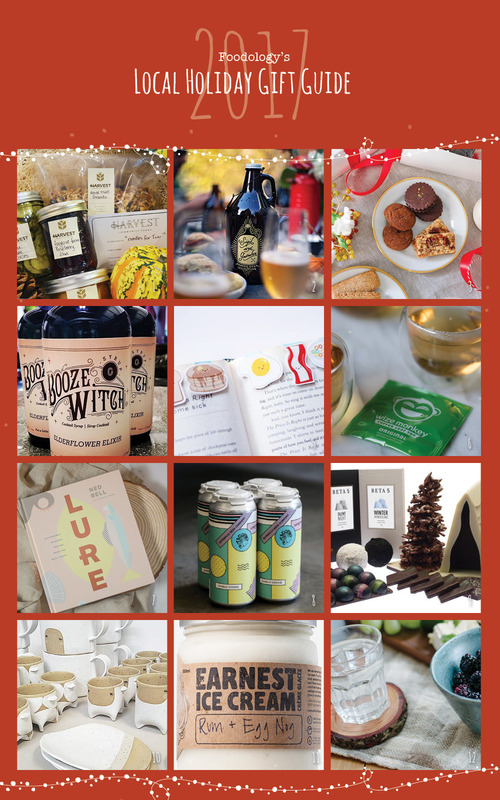 Looking for local holiday gift ideas for your foodie friends and family? Then you’re in luck because we are surrounded by many delicious options in Metro Vancouver. It’s a great idea to shop local and support small businesses. According to LOCO BC, for every $100 spent with a local BC business, $46 is recirculated back into our local economy versus $18 for multi-national chains. In Canada, local businesses recirculate 2.6 times more revenue back into the local economy than multi-national chains. Save space under the tree for Harvest’s Holiday Gift Boxes – an easy choice for the foodie in your life (and who doesn’t love food?). The boxes cost $45 and are filled with house-made items, including pickles, jams, preserves, and granola mixed from local grain farmers. Also included is a gift certificate for lunch for two at Harvest! As Vancouverites love for craft breweries grows and grows, buying growlers (a jug for beer or cider) can get personal. I love some of the designs from our local breweries, but nothing says the “ultimate gift” like a customized growler with your friends name on it. My favourite bakery in Vancouver, Beaucoup Bakery, has new kinds of holiday cookies – Spiced Rye Sablés, Rye Ginger Cookies, Smokey Russian Tea Cakes, Malted Coffee Thins, Chocolate Pistachio Sandwich Cookies and Pecan Praline Shortbread. If you’re heading to a holiday party, you’ll be a hit with a box of their cookies. Also, don’t forget to grab a croissant too because they are to die for. Gillespie’s Fine Spirits is based out of Squamish, BC and makes handcrafted artisan spirits and cocktail accompaniments from BC grown grains and fruit. Everything is small batch and handmade. Boozewitch is the name of their line of cocktail accompaniments, which you can add to your list of local holiday gift ideas. Currently, they have their Sipping Vinegars (Shrubs) and Elderflower Elixir, which are fantastic for a cocktail or a mocktail. Instead of eating your breakfast, you can visually enjoy it as you flip the pages of your favourite book. Vancouverites Diana and Erica of CraftedVan specialize in magnetic bookmarks, magnets and cards made by hand and with love. Wize Monkey has just launched their Strawberry Hibiscus loose leaf tea to their collection of farm-direct coffee leaf teas. It’s something different and has positively impacted the Nicaragua community as it has a 9-month window to harvest coffee leaves compared to 3 months for harvesting beans. It’s able to create more jobs and in turn eliminate seasonal hunger in coffee communities and boost rural education and student retention. The best part of the West Coast is the seafood. This stunning cookbook, authored by chef and seafood advocate Ned Bell, features simple techniques and straightforward sustainability guidelines around Pacific species as well as 80 delicious recipes to make at home. You’ll find tacos, fish burgers, chowders, and sandwiches – the types of dishes that fill bellies, soothe souls and get happy dinner table conversation flowing on a weekday night – as well as elegant (albeit still simple-to-execute) dinner party options, such as crudo, ceviche and caviar butter. Tacofino has teamed up with Superflux and Four Winds to create this exclusive beer that’s spicy, dark and chocolaty. You can find them at Tacofino locations in Vancouver and Victoria, as well as Strathcona Brewing Company. The award-winning Beta5 is a classic choice for local holiday gift ideas as everything from their chocolates, cream puffs and chocolate sculptures are unique and delicious. Kick your food presentation up a notch and say hello to locally-designed dishware by local artist/designer Grace Lee. There are lots of flavours to choose from, but the Egg Nog and Rum is a holiday winner. Don’t attempt to wrap this up or use it as a stocking stuffer. It needs to be devoured right away. Take a piece of the West Coast into your living room, these natural coasters provide protection and charm to your home.